Denise Souza began her personal journey to wellness through holistic modalities and nutritious food when she was diagnosed with Gilbert Syndrome in the late 1980’s. At eight years old, her daughter was misdiagnosed with migraines, constipation and far-sighted vision. During the same time, her son had chronic ear infections and respiratory congestion. After no resolution with traditional means, Denise sought holistic answers with Dr. Stephen Driscoll. Their rapid success with holistic modalities led Denise to study this field and share her knowledge. 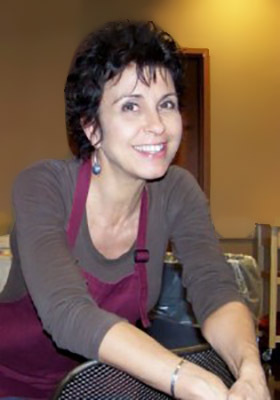 Denise is a mother, health advocate, holistic nutrition lifestyle consultant, colon therapist, lecturer, cancer survivor, educator, and perpetual student. She holds a Master of Science with high honors in Holistic Nutrition and a Bachelor of Art in Psychology. As a Colon Hydrotherapist she is certified by the International Association for Colon Hydrotherapy and the National Board for Colon Hydrotherapy. Denise also served as secretary of the North Carolina Colon Hydrotherapy Safety Association and vice president of the American Holistic Medical Association. She has completed Level 4 in Touch for Health training and is trained in Bio-Electrical Impedance Measurement testing. She is co-founder and facilitator of the GET LEAN Weight Loss and Wellness Program as well as the Prescription for Wellness Program. Denise believes we are creations of God and stands in awe at the magnificence and intricacies of the body. The workings and abilities of the body can sometimes seem so complex at times, yet the blueprint for wellness is quite simple when empowered with knowledge. Denise’s goal is to teach her clients not to limit their changes or goals to a short window of time or specific short-term goal but rather to think of lifestyle changes. Through educating her clients she believes they are empowered to change their lifestyle, which in turn changes their lives. She encourages clients to think outside the box, whether modifying a recipe, reshaping their perception of nutrition, dieting, detoxifying or desiring overall wellness. In 2006, Denise and her husband, Jerry, moved from Massachusetts to Raleigh, North Carolina. They both enjoy the outdoors and the wonderful, long summer days. They have three grown children and three grandchildren scattered around the world. With wellness and vibrancy as the goal, To Our Health recipes are also free of nightshade vegetables and low in salt, fats and animal protein. 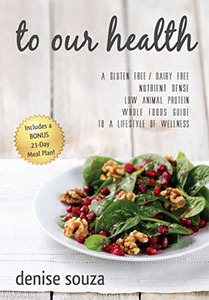 To Our Health offers crucial insight into the reasons behind the lifestyle requirements, answering questions of what, why, and how as well as offering easy tips to expand the recipes in this book, ensuring a seemingly endless array of delicious, healthy meals. A complete 21-Day Meal Plan takes the guesswork out of making the switch and helps you be successful from day one.